Here's a joke. What do you get if you cross a pirate with an astromechanical droid? Aaaarrrr2-D2. And here's another joke. 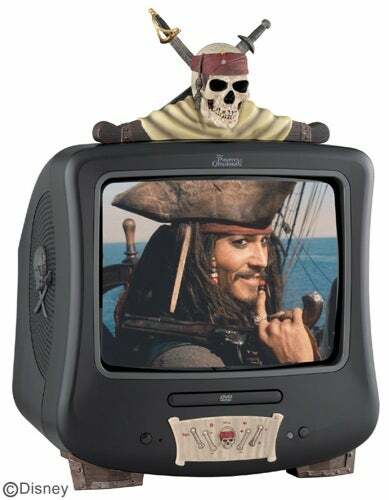 What do you get if you cross Pirates Of The Caribbean with a TV-DVD player and CD player? A rather tragic Pirates-themed home entertainment set that will bring out the rapin', pillagin', ooh-arr-me-hearties sofa pirate in you. Or not. Seriously, keep making these. I can&apos;t get enough of em. The TV has a built-in DVD player, two "wooden" legs (that's one more than most pirates) and a dinky remote that looks like a compass. That'll cost you 246 doubloons. The stand-alone DVD which is built into a ship's wheel is $105, and the CD player, hidden away in Jack's treasure chest, just $66. Let's face it, if you are a pirate freak, any one of these three gizmos knocks last week's pirate ship - along with any vestiges of good taste you might have had - into a tricorn hat.